In a day that made headlines internationally, the UC community collectively walked out in defense of public education last Thursday, September 24. It started at dawn on all 10 campuses with UPTE-CWA’s technical and research workers on strike, joined by faculty, students and other UC staff throughout the day on picket lines, at rallies and teach-ins. The San Jose Mercury News published a slideshow that gives an overview of the extraordinary scope of the protests statewide. The San Francisco Bay Guardian has a series of photos that illustrate the unity of students, staff and faculty working together to save public education, while Monthly Review described the union solidarity involved in planning the unprecedented day of actions. Here are some of the many creative ways participants spent the day. Time magazine noted a large turnout at “normally placid” UC Irvine. At UC Davis, students held a naked protest to show how they were being “stripped” of their right to public education, and staff, faculty and student activists spoke out at a noon rally about the issues at stake. At UC Santa Cruz, construction workers, city bus drivers and UPS drivers refused to cross the picket lines, and students and workers occupied a campus building overnight. At UCLA, nearly 1000 demonstrated and a group of activists also sat in at the chancellor’s office until he agreed to meet. Here is a video showing UCLA activities on the day of the walkout. State Senator Leland Yee (D-San Francisco) addressed the strike/walkout rally at UCSF. At UCSD, hundreds of faculty and students walked out to join union picket lines, and discuss what was happening to California’s higher education system. There were also lively protests at UC Santa Barbara, UC Riverside, and UC Irvine. Even the newest and smallest campus, UC Merced, and the Lawrence Berkeley National Lab, held demonstrations. 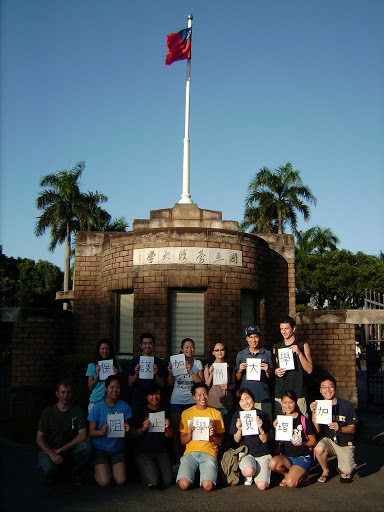 In Taiwan, UC Education Abroad students participated in the protest by posing at the front gate of the National Taiwan University, where they were studying. Their signs said, “Protect the UC, prevent fee increases" in traditional Chinese characters. Berkeley faculty held a well-attended teach-in the evening before the walkout, which is now available as video. A UC Riverside professor/novelist wrote about why the walkout was an invaluable teaching moment. University of Arizona students and staff rallied in support of the UC actions. Where are the resources to support UC? The university’s billions of dollars in unrestricted reserves, which could help it get through a temporary budget shortfall, are the topic of this radio interview with economist Peter Donohue.